At Birches School we believe that learning should be a joyful, engaging partnership among students, teachers, and peers. To that end, we offer multi-age classrooms that are rich in integrated, thematic learning. Students at Birches are driven to become creative, critical thinkers, empathetic friends, mindful leaders and lifelong learners. Birches builds its curriculum around enduring questions and overarching themes. Over the course of the school year, each class will study three unique themes. These themes change from year to year depending on class makeup and interest. They often connect to the natural world in some way and always provide rich content and cross-curricular links to engage children in their studies. Click here to see an example of our Silk Road thematic curriculum in action. One important aspect of Birches is immersion in Spanish twice a week, when students are introduced to Spanish in a playful, engaging way. Our Spanish teacher, Maria, a native Spaniard, teaches through full immersion. Students quickly adjust and start to speak in full phrases within weeks of starting kindergarten! Each class focuses on speaking and conversation skills and students practice the language through a variety of songs, games, and written tasks. 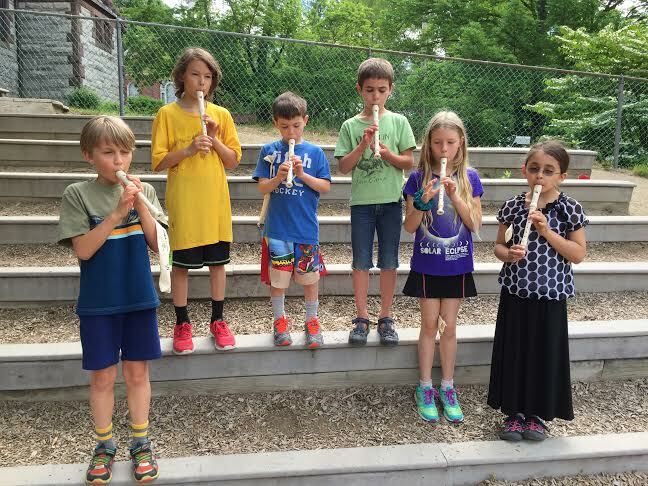 Music classes at Birches are founded on the premise that students are active participants. As they sing, move, dance, and play instruments, they are learning. Our students are given many opportunities to nurture their musical selves kinesthetically, aurally, and visually. Basic skills, such as keeping a steady beat and matching pitch, are introduced in the early years. Older students are taught the fundamentals of music theory, such as reading quarter notes, eighth notes, rests, and so on. In 3rd Grade, recorders are introduced. We frequently have “music shares” at school meeting. We also put on musicals, plays, and have an annual community folk dance. Birches offers yoga instruction for children as part of its physical education program. Short mindfulness practices are also incorporated into the school day, usually when transitioning from one activity to another, for example, when coming in from recess to begin a numeracy bloc. A wide range of research indicates that mindfulness provides an excellent starting point for learning and creativity. For further information, please see an article from the "Journal of Applied School Psychology" describing the beneficial effects of mindfulness training for 1st, 2nd, and 3rd graders.